Humans are inquisitive by nature. We seek details, information, and assurances regarding our actions and the associated outcomes. One area where we lack adequate auditability and transparency is the original source of our medicines. Patients must trust that pharmacists sell and supply medicines that come from reputable sources. Pharmacists, in turn, must ensure the medicines they receive from suppliers are fit for their intended purpose and have been securely stored and transported. With a rise in counterfeit pharmaceuticals accounting for over $200 billion dollars in lost revenue in 2017, pharmacists and patients alike need greater visibility into where a particular medicine comes from and how it’s been handled throughout its journey. Counterfeit pharmaceuticals also take a devastating toll on people worldwide, according to research conducted by Strategy&—PwC’s strategy consulting business. PwC, an AWS Partner Network (APN) Advanced Consulting Partner, has developed deep expertise in helping businesses understand how they can use blockchain technology to solve challenges and drive results. Forward-thinking companies are looking to new technologies such as blockchain to provide visibility into medicinal sourcing and the journey a medicine takes to move from creation to the hands of an end user, whose quality of life depends on its authenticity. Through the use of blockchain technology—a distributed ledger enabling trusted transactions among multiple parties—the pharmaceutical supply chain can become more secure, streamlined, and auditable. By developing an end-to-end blockchain solution on Amazon Web Services (AWS), pharmaceutical companies can take advantage of the AWS commitment to security and compliance. 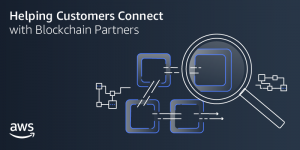 With more than 120 AWS services and thousands of independent software vendor (ISV) solutions available on AWS, developers can integrate existing technologies with a blockchain solution to drive additional insights and value. The World Health Organization (WHO) estimates counterfeit pharmaceuticals lead to more than 1 million deaths annually and can cause severe adverse reactions. Given the potential for falsified pharmaceuticals to enter the supply chain, it’s imperative pharmacists and patients gain transparency into where medicines originate and if they’ve been tampered with, replaced, modified, or stolen. Pharmacists also need to ensure medicines have been stored correctly throughout their journey and contain the correct quantity and strength of the drug. Responsibility for providing such assurances often falls on manufacturers or wholesalers, resulting in limited visibility for the pharmacist and patient. Along with the inherent health risks associated with taking counterfeit pharmaceuticals, the potential for falsified medicines to enter the supply chain and lack of visibility into product quality and authenticity can cause a patient to feel he/she can’t confidently take their medicine, which also drives detrimental health effects. New safety measures for medicines, such as the Falsified Medicines Directive (FMD) in the European Union, will begin to address current pharmaceutical supply chain challenges. Still, security and integrity of data remain issues especially in light of the recent cyber security attacks. Through its immutability, transparency, traceability, and inalterability, a blockchain solution can drive substantive improvements to the pharmaceutical supply chain. Using blockchain technology to track a drug through its entire lifecycle provides all parties assurances of its safety and authenticity. At every stage of the process, barcodes or smart tags could be scanned and recorded onto a blockchain ledger system that, in turn, records and creates an audit trail of the medicine’s journey. Sensors can also be incorporated into the supply chain, with temperature or humidity being recorded onto the ledger system. This is especially important for drugs requiring refrigerated storage, such as insulin or expensive, specially manufactured medicines. When the drug reaches the pharmacy, the pharmacist can tell through the blockchain audit trail if the drug has been compromised at any point of the journey. When a prescription is dispensed, biometric measures can be used to record the dispenser and pharmacist checking the prescription. All of this be recorded onto the distributed ledger, allowing drugs to be tracked from the moment of creation to the moment the patient takes the drug home. Reduce complexity and costs. The supply chain becomes automatically traceable and less costly to track. For example, information systems can hold expiration date details, which improves stock control and rotation. Reduce errors. Parties can verify the source of a drug to ensure its authenticity, reducing harm to patients with the improvement of drug checks. Enhance security. The immutable nature of the data on the distributed ledger can prevent malicious parties from altering drug information and reduces the risk that counterfeit drugs will make it into the supply chain. Create shared and trusted transactions. All parties are able to access the drug information when needed to ensure the quality of the drug being dispensed. Create an audit trail: Drugs are easily traced, which makes recalls easier. Parties can see if the process has become compromised at any point. Enhance transparency between authorized parties. All parties can see every stage of the drug journey to ensure the drug authenticity. Regulators such as pharmacy inspectors can monitor the rate of counterfeit drugs entering the supply chain with more accuracy. Through the use of blockchain, the pharmaceutical journey could become more secure, transparent, and streamlined. Pharmacists can trust that a drug given to a patient is of the highest quality and has not been damaged or de-natured. Patients can take comfort in the knowledge that the supply chain has been recorded at every stage and the drug is authentic. Learn more about PwC’s blockchain consulting capabilities, and connect with PwC to discuss how you can build a blockchain solution on AWS.